Having worked with Voltage Optimisation in Australia for over 10 years, we have vast experience with the technology. Our clients benefit from this. 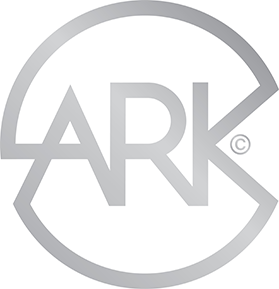 You receive an accurate appraisal of the suitability of the technology for your business and a project delivered by experts in the industry. We manufacture the equipment here in Australia and sell it to clients and energy saving companies across the world. Typical ROI of 25-50% p.a. Approximately 90% of buildings in Australia receive electricity at a higher voltage than they need. The allowable voltage range in Australia is 216-253 volts (AS60038). Due to the nature of the electricity grid, most buildings receive voltage on the higher end of this range. Voltage optimisation brings the voltage within your premises to the optimum level for the efficient and safe operation of your equipment. When many types of equipment receive voltage within this optimum range, they consume less power and last longer – resulting in significant financial savings for your business. The optimisation of voltage is illustrated in the chart to the right. The green band reflects the voltage range that the majority of electrical equipment operates most efficiently within. 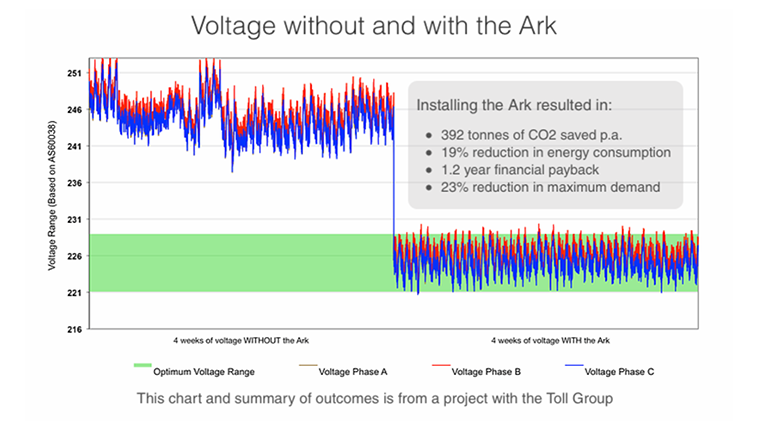 The left hand side of the chart is before the Ark unit is installed, and you can see the voltage move into the optimum range once the Ark is installed. Is Voltage Optimisation Suitable for You? Voltage Optimisation provides many benefits, however it is not right for all clients and all buildings. There are important factors that need to be taken into account on every project to determine if voltage optimisation is suitable. This is our expertise, so we will conduct this analysis for you and advise accordingly. However, if you are interested in understanding more of the intricate details, read on. Approximately 1 in 10 buildings receive voltage within, or close to, the optimum range for equipment of 220V to 230V. If your building consistently receives voltage within or close to this range, then the effectiveness of voltage optimisation equipment is significantly reduced. This is a key determinant of the energy savings you will receive. The more energy efficient your equipment, the lower the savings from voltage optimisation. More specifically, motors operating in their ideal loading range or with variable speed drives, inverter air conditioners, T5 electronic ballast lighting and some types of LED lighting, all operate in such a way that voltage optimisation does not generate significant energy savings. If the majority of your equipment is older and less efficient or motors are oversized for their application (and operating at partial loading much of the time), then the savings from voltage optimisation will be much higher and provide a quicker return on investment. Like most sites, if you have a mix of efficient and inefficient equipment, reasonable savings from voltage optimisation can be achieved and the technology can be financially attractive. Voltage optimisation can be installed on a site that is operating extremely efficiently, to provide small energy savings plus power quality benefits (and the cost savings associated with this), and a correspondingly longer payback. This may be acceptable if you are pursuing aggressive energy reduction or environmental targets. In Summary, the mix of your electricity loads and the efficiency of your existing equipment has a large influence on the savings that can be achieved, and thus whether voltage optimisation is likely to meet your investment criteria and be suitable for your site. Voltage optimisation equipment is sized to the maximum electrical demand consumed at your site, with a safety buffer for site changes that could result in increased demand. If you have a relatively consistent profile of electricity usage and demand, a higher return on investment from from voltage optimisation will be achieved i.e. there will be high utilisation of the equipment, with a high accumulation of energy savings. Conversely, if a site has very high demand for short periods of time, and the remainder of the time the demand is much lower, then the return on investment will also be much lower. The equipment is sized to cater for the very high demand periods, and then has low utilisation and accumulated savings the rest of the time. The physical size of the equipment is similar to a family fridge. There are many different sizes dependent on the electrical rating required, however this provides an indication. The aim when installing voltage optimisation equipment is to position the unit as close as possible to the main switchboard in order to minimise the cost of cable to and from the equipment. Typically, up to about 20m away from the main switchboard is viable, beyond that the cost of cable can have a significant impact on the project. 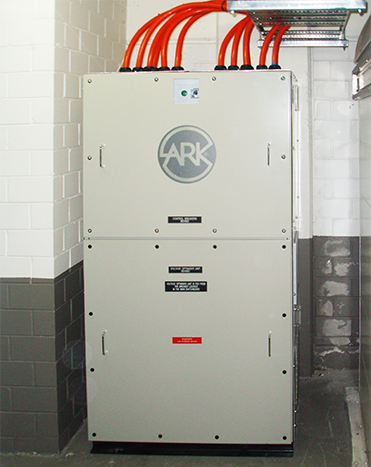 The ideal situation is to have space available for the voltage optimisation unit within your main switch-room. If not, in an adjoining room or outside nearby. Voltage Optimisation equipment is connected to a switchboard (typically the main switchboard) within a building. It is installed in series with the electricity supply – the power is routed out of the switchboard, through the Voltage Optimisation equipment, and then back to the switchboard to supply the connected electrical loads. If your switchboard is very old or in poor condition, additional costs can be incurred to ensure that all electrical works, and the switchboard itself, are compliant with regulations. Fortunately, the majority of switchboards are in a well-maintained condition, and if they are not, there are other important reasons to upgrade them to a safe and compliant standard, aside from the impact on the cost of a voltage optimisation project. Ideally, you will want to have secure tenure of your building for at least the financial payback period of the Voltage Optimisation equipment, which is typically 2 to 4 years. The equipment has an expected lifetime of approximately 50 years, so its benefits will continue for many years after it has paid for itself. If you move premises, the equipment can be relocated. If it has already paid for itself, then the relocation costs can be easily justified and quickly recouped. Voltage optimisation is not a silver bullet that is applicable and beneficial to every building. In our experience over many years and industry types, we’ve found that approximately 30% of buildings are not suitable, or cannot achieve a commercially viable return on investment from voltage optimisation. Fortunately, this also means that approximately 70% of all buildings are suitable and able to achieve a viable return on investment.